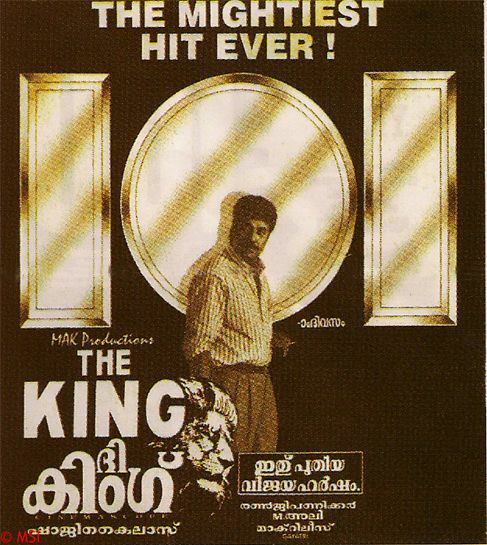 Mammootty as Angry young man has been always a visual treat for the fans.The king released in 1995 sent the entire generations irrespective of gender into delirious excitement. The one name locking prominently among the List of respected and never forgotten IAS officers will be none other than Thevalliparambil Joseph Alex (Mammootty).Many youngsters were deeply inspired due to the fearless attitude and the way he handled corrupted politicians and bureaucrats with gumption.The sexiest outburst against the newly appointed sub-collector was welcomed by the audiences. The fights and tussle between Joseph Alex and Shankar IPS (Devan) and the scene where Joseph Alex says ” Da pulle!!!! Ee Azhichu ittekunna ee mundu undallo,Ithu yeduthu Aanugalle pole madakki kuthanum ariyam Joseph nu ” was one of the most notable scenes in the movie. Yes !!! I have an extra bone!!!! Very Well said by Joseph Alex.22 years of an extra bone and the savage performance by Mammootty created huge adrenaline rush and the desire to make changes in the society through Thevalliparbil Joseph Alex.No wonder it ended up being one of the mightiest Industry Hits of all time or rather “The King of all times “. Previous articleCharlie – Happiness is when you make others blithe!! Next articleIts official now , Big B to have sequel. !